Ralph Leonard Weale was born at Godalming, Guildford, Surrey, in 1899 but I could find no record of his birth. His mother was Mrs Florence E Weale of (at the time of his death) 30 Lansdowne Street, Hove, Sussex. In the 1911 census 12-year old Ralph was living with his grandfather leather dyer George Weale, originally from Surrey, and his second wife, Emma, at 21 Goldcroft. The report of his death in the Western Gazette reported that he worked at Lipton's Stores before enlisting in 1917, but he enlisted at Penzance, Cornwall, initially in the Hampshire Regiment (Service No 43273) but later transferring to the Worcestershire Regiment (Service No 57536) - see his Roll Card below. From other sources it is known that he was in a Lewis gun section in the 3rd Battalion, Worcestershire Regiment. He was sent to France around April 1918 while the Battalion was part of 25th Division fighting in France and Flanders. On 9 April 1918, the 25th Division were in the front line near Ploegsteert when the German Spring Offensive was launched (The Battle of the Lys). They suffered badly in heavy fighting around Hill 63 and by 12 April the men of the 25th Division were involved in holding a new defensive front line in front of Dranoutre and Kemmel. The following day they were fighting a defence on the high ground East of Bailleul, but by 15 April the high ground and the town of Bailleul were in enemy hands and they withdrew through Boeschepe on 16 April . After only four days rest at Abeele, the 25th Division joined an attack by French troops (who had lost the key position of Kemmel Hill the previous day). In thick fog following a night of heavy rain, the 25th Division, captured the railway line but were force to withdraw to a narrow sector along the Le Clytte to Kemmel road. The Division were withdrawn on 4 May and moved back west of Poperinge. Ordered to a quiet sector south of the Aisne, the Division expected to recuperate, but by the end of the month were again facing a heavy German attack in the Battle of the Aisne. Large casualty numbers were suffered as the Germans broke through. In June 1918 the much depleted 25th Division was broken up and the 3rd Worcesters were transferred to 57th Brigade, 19th (Western) Division with whom they took part in the Final Advance in Picardy during which Ralph Weale was fatally shot by a German sniper on 9 August 1918. He was aged just 19 years old. On 30 August 1918 the Western Gazette reported "News has been received by Mr G Weale, Mudford Road, that his grandson, Private R Weale, Worcester Regiment, has been killed in action in France on August 8th. The OC of his platoon, has written to say that he was shot through the head by a sniper, and death was instantaneous. He was one of the best Lewis gunners in the platoon and a good shot. The deceased soldier was formerly employed at Lipton’s Stores, and was a Sea Scout before joining up about twelve months ago. He had been in France four months when he met his death." 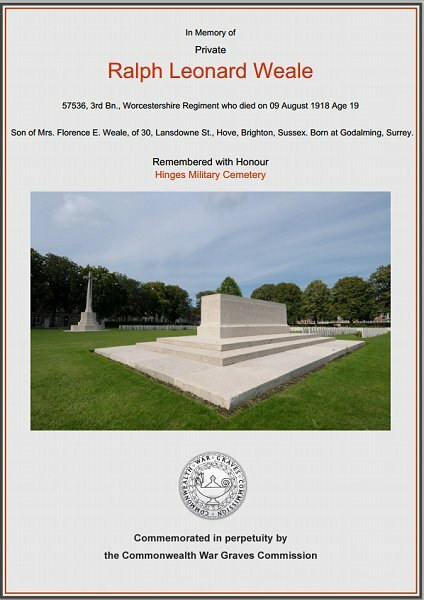 Ralph was interred in Hinges Military Cemetery, Pas-de-Calais, France, Grave C7 and his name is recorded on the War Memorial in the Borough. The Commonwealth War Graves Commission certificate in memory of Ralph Weale.